Some of my favourite holiday memories involve huddling around the crackling fire on Christmas Eve, nibbling on cheese and sipping eggnog. My parents both grew up in Quebec and, although they’re both Anglophones, a certain element of the French culture has always been woven into our holiday gatherings. Like tourtière and Christmas Eve being a big thing. 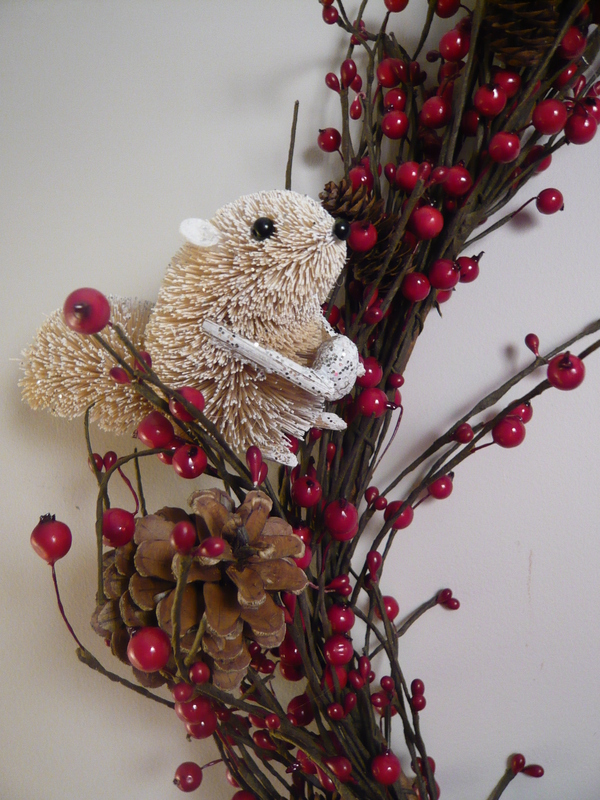 I spent most of my Christmases out in rural Quebec at my grandparents’ farm and they always had an abundance of little Christmas critters decking the halls. This is my little ode to them. I didn’t have time to run to the store so I only used materials I already had on-hand. I also only had nap time to make my wreath, so it was super quick. If you hurry, you can do it in less than an hour (the hook just needs to be secured to the wall for an hour before you put weight on it). Determine how big you want your wreath to be and then bend your garland into the shape of a circle, securing it with floral wire. I will confess – I didn’t have any wire so I actually just used Christmas decoration hooks and twisted them around the garland until my circle was secured. Hold up your wreath and determine which side is up. 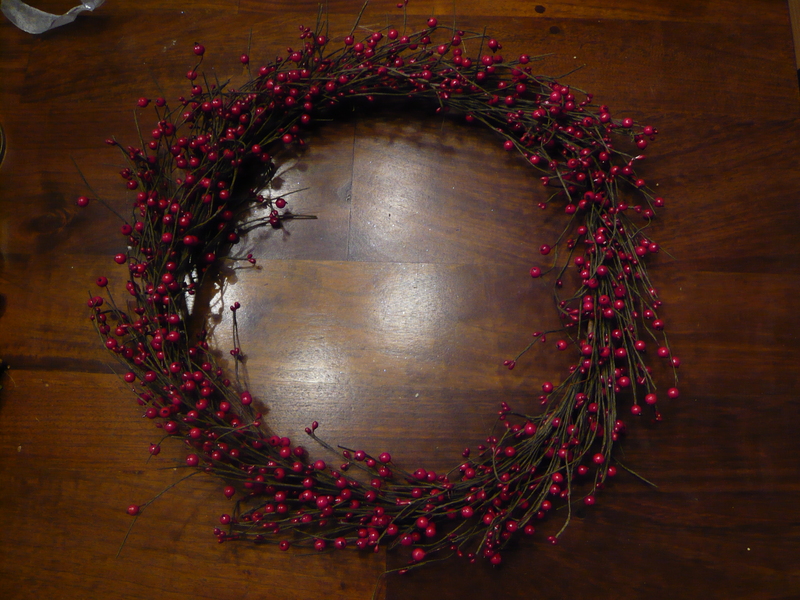 Since the part of my wreath where I secured the circle was thicker than the other side, I ensured this side was up or it would drag my wreath down when hung, turning it into an oval. 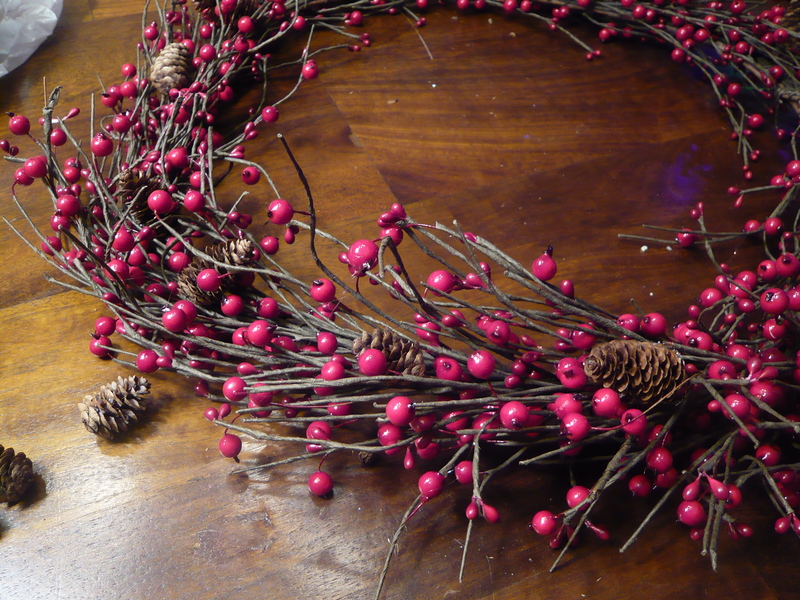 Berry garland wrapped into the shape of a wreath and secured with wire. Select your pinecones (I chose small ones based on the size of my wreath), position them, and glue. Try not to have all your pinecones facing the same direction – it looks more interesting to have some facing each other or popping forward. Glue pinecones facing various directions to keep things interesting. 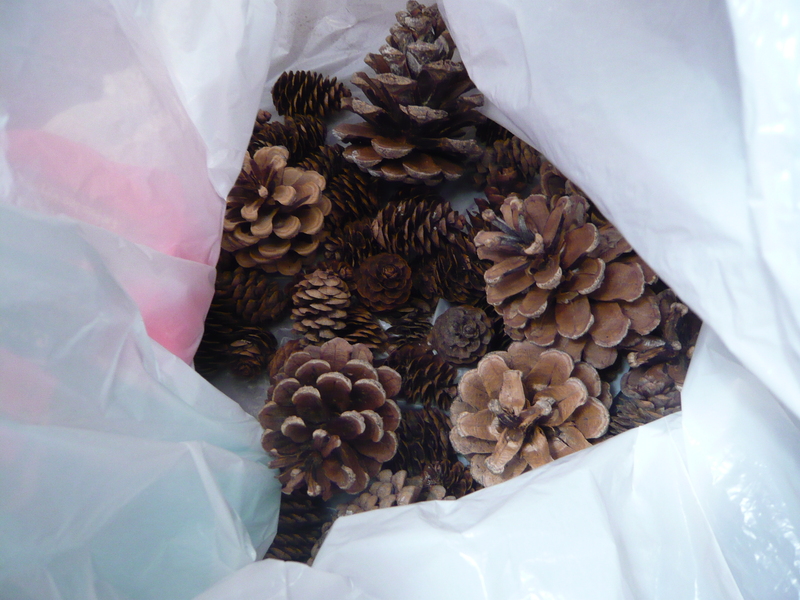 Look for pinecones in a variety of shapes and sizes. Choose a strip of pretty ribbon, pass it through the centre of your wreath and glue both ends together so you have a continuous loop. I just used ribbon left over from last Christmas. Choose where you want your wreath and hang it! Ideally, I would have just used a pin and slipped it into the top of the ribbon loop to secure it to the wall. Since I didn’t want a pin hole in my wall, I tied a small loop of clear fishing wire through my wide ribbon and used that to hang my wreath on the decorating hook that I had secured to the wall. This is when my three-year-old woke up from his nap and decided my wreath needed BIGGER pinecones. And…he was right. I started popping them in to add a little variety and volume. Finally, I stole (literally) some of my favourite woodland creatures from the Christmas tree, taped down their mounting strings, and placed them throughout my wreath. 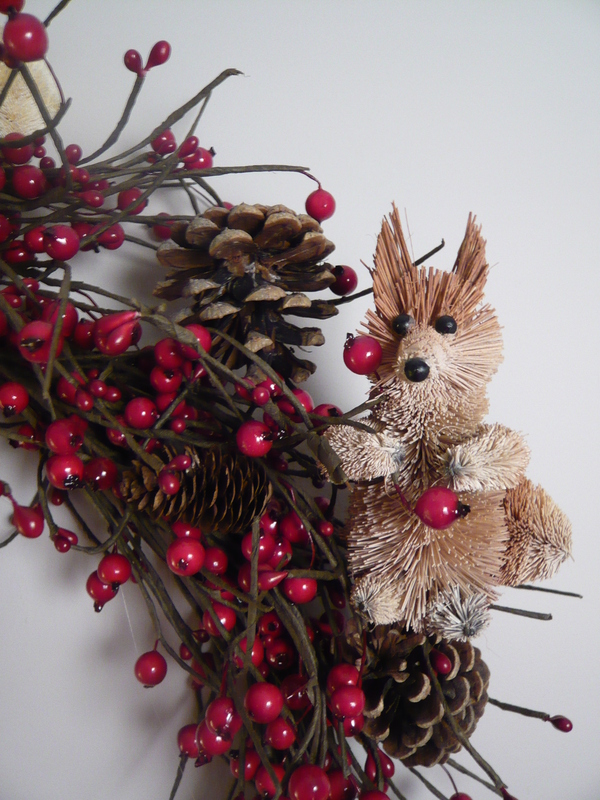 Nestle critters between the branches of your garland – no glue required. I tucked a berry between his paws to keep him secure. 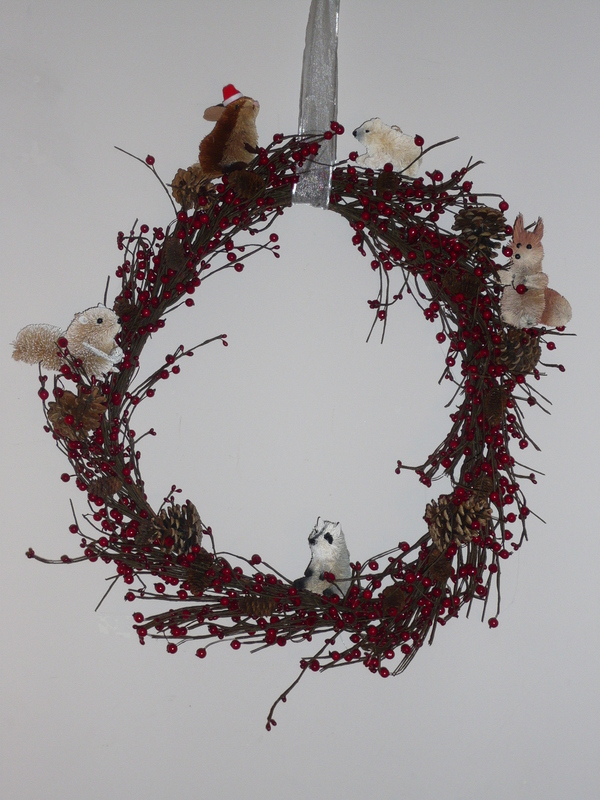 There you go – a straight-from-the-forest woodland creature Christmas wreath. Wreath with large pinecones and critters added in.